CEDARVILLE — “Cedarville Boas” doesn’t quite have the same ring to it, but it’s how the Cedarville girls volleyball team plays opponents: Give them an advantage, and they’ll squeeze the life out of you. In a nip-and-tuck battle with Ohio Heritage Conference and Route 72 foe Greeneview, Cedarville did exactly that. 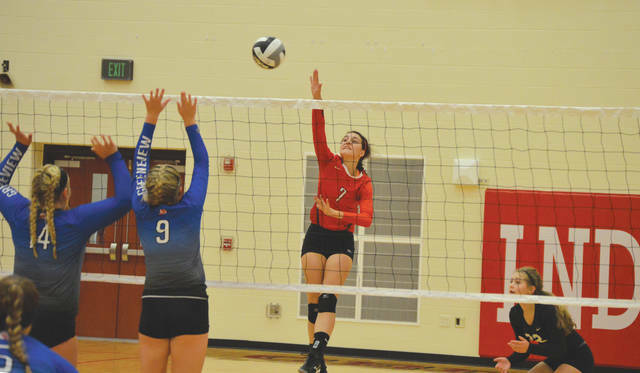 The Boas… er… Indians claimed a 25-23, 20-25, 25-23, 25-20 win over the constricted Rams in a high school varsity volleyball match Aug. 22 at Cedarville High School. Indians coach Bobbi Jones says the team’s game plan all along is to get out front of the opponent, and then put the squeeze on. In the first set, Cedarville (2-0, 1-0 OHC) jumped out to a quick 3-0 lead behind solid lead-off serving from Abigail Sheridan and some jarring spikes from Sara Beste. Greeneview managed to tie the set on five different occasions, but another Beste bash won the opener, 25-23. The Rams returned the favor in the second set. It was Greeneview rolling out to a 3-0 lead in set two. Solid services from Ashley Schloss, combined with strong net play from Caitlin Sweat and Madyson Brittingham down the stretch, earned the Rams a 25-20 win in Game 2. The third game saw Cedarville jump out in front, this time by a 5-0 margin to start things out with solid opening serves from Maddie Hines to go with a block and a kill from Brianna Hanson. Again the Rams battled back to even the score at 23-all, but this time Beste dinked for a go-ahead 24-23 tally, and the Rams miscommunicated on Hanson’s ensuing serve to give the Snakes a 25-23 third-game win. Greeneview (1-1, 0-1 OHC) was finally “squoze” in Game 4. Cedarville combined Beste kills with solid Sheridan opening serves to slither out to a 4-0 opening lead. Greeneview never recovered in the 25-20 final-game loss. Beste had a match-high 26 kills to go with a service ace and seven digs. 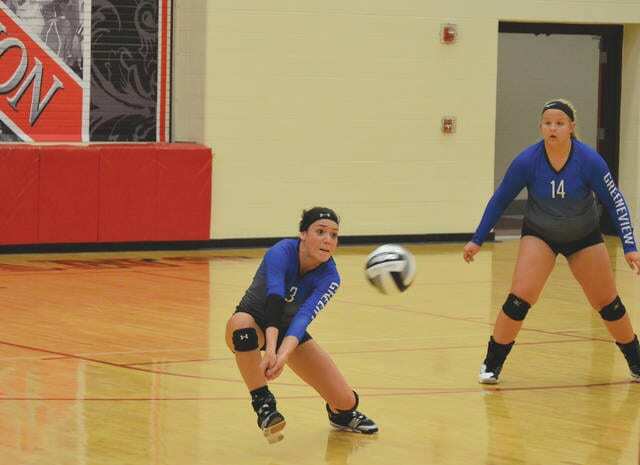 Sheridan finished with 10 kills and eight aces, and Kalley Schulz had 34 assists with seven digs. Jones liked the play of freshman Elly Coe as well. “You can’t let the other guys get on a roll. So you get that set, that pass, that kill and get the ball back. Now put some points on the board,” Jones said. They did just that. Greeneview coach Hollenbaugh liked her team’s effort. Unofficially, Sweat finished with a team-best seven kills and two blocks, while Schloss had six kills and a pair of service aces. Cedarville heads over to take on another solid OHC foe — Springfield Catholic Central — on Thursday, Aug. 24. Greeneview is home that day in an OHC match with London Madison Plains. The Cedarville and Greenview will meet for the rematch on Sept. 28 in Jamestown. Cedarville’s Sara Beste hits around Greeneview defenders Caitlin Sweat (14) and Amanda Mickle (9), during Tuesday’s Aug. 22 girls high school volleyball match at Cedarville High. Beste had a game-high 26 kills in the Indians’ four-set win. Greeneview’s Maddie Hines gets low to return a Cedarville serve, during Tuesday’s Aug. 22 match at Cedarville High School. 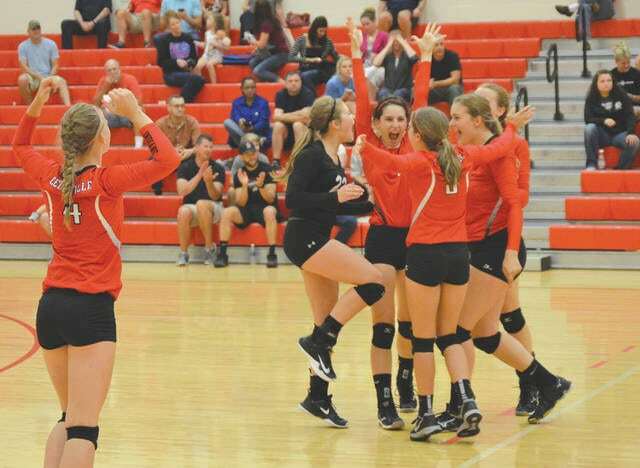 The host Cedarville Indians players celebrate after recording the match-winning point in Tuesday’s Aug. 22 four-set win over Ohio Heritage Conference rival Greeneview.